I come from an Italian family so I grew up around some really great Italian food! While I didn't like sauce until I was older, I was a huge pasta fan from the start! Noodles, butter, and Parmesan cheese was my favorite meal! Not the healthiest choice, but it kept the carb-aholic in me happy. Now I try to enjoy lighter twists on my Italian favorites. As I got older and more willing to eat healthier options, I realized that Italian eating can actually be healthy. There is nothing better than roasted vegetables, or homemade tomato sauce with fresh basil. The Italian flavors are still there but the rich oils and grains are not. 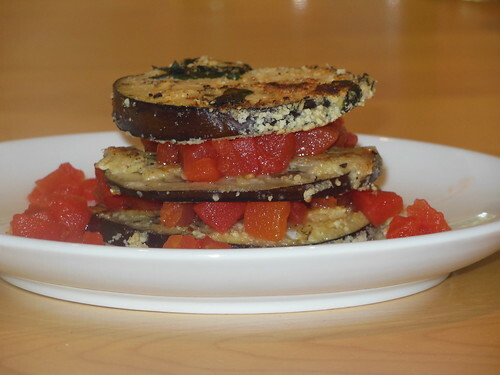 Here's my lighter twist on eggplant Parmesan. Little disclaimer... Despite the name there is no cheese in this recipe! It is 100% Paleo! Slice your eggplant into rounds. In a small saucepan warm your crushed tomatoes over medium to low heat. Prepare two separate plates, one with a whisked egg and the other with the almond meal and 1/4 cup chopped fresh basil. Preheat your skillet over medium heat with the 1/2 tbs. olive oil. 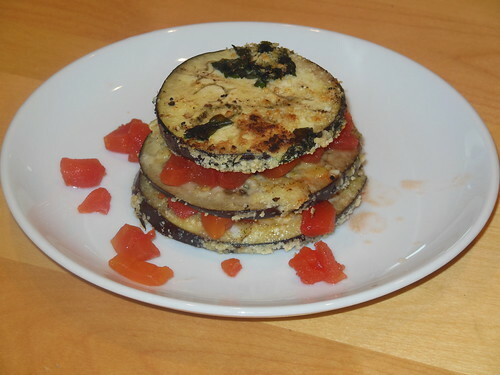 Dip your eggplant rounds into the egg mixture, and then the almond meal and place on your skillet. Cook thoroughly on each side flipping once until the eggplant is tender. Serve in stacks with the crushed tomatoes in between each layer. What's your favorite Italian dish?? Any meals you want to see lightened up?